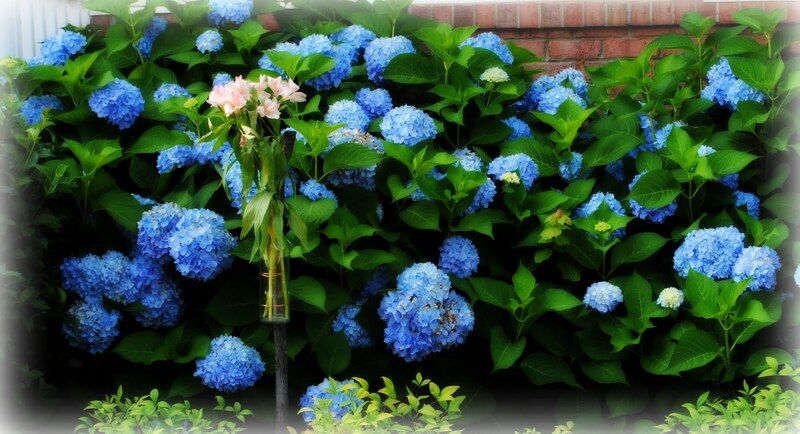 Hydrangeas always catch my attention!! But on my morning walkabout, there was something a little different that caught my eye . 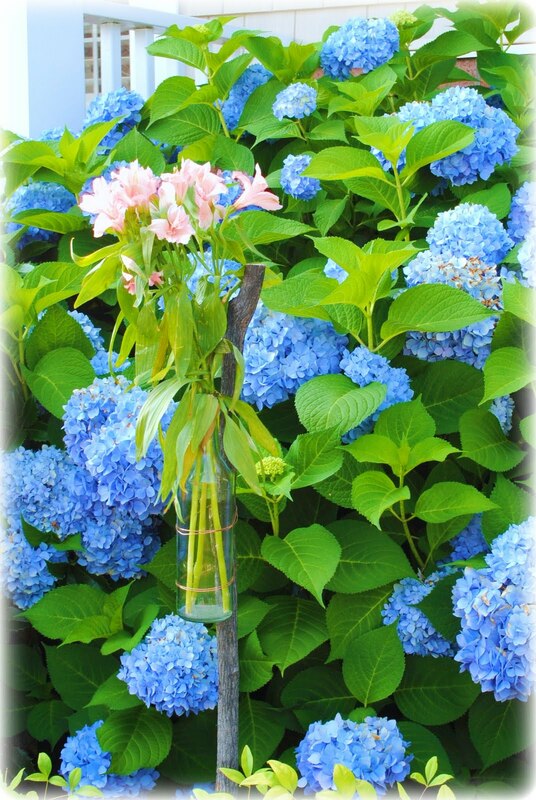 . . a splash of pink right in the middle of the beautiful blues. What?? Eye-catching! Sweet! Unique! Definitely worth closer inspection. 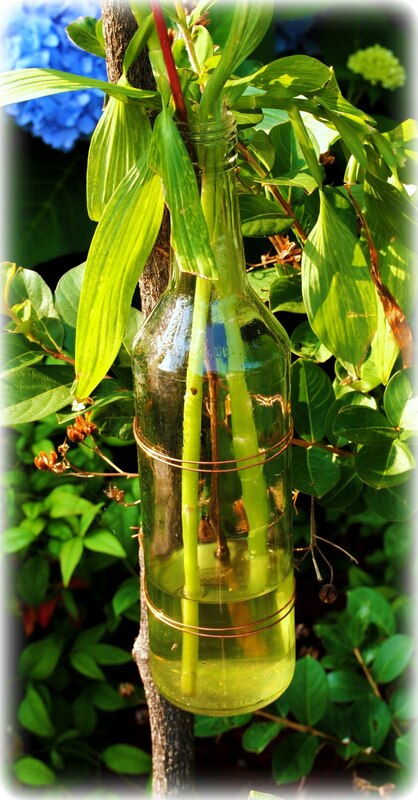 Closer inspection reveals a clear glass bottle, copper-wired to a branch. Branch shoved into the ground. Glass bottle filled with pink alstroemeria. Lovely against the blue and green background. Is there no end to my neighbors' gardening creativity? Shabby chic . . . flea market style . . . in the garden. Wow! If you take a look at this blog, you would assume that I graduated my Oldest Daughter and then drowned my sorrows in a large crock of pickles and fell off the end of the earth. Not completely true. Actually, my brain and body stopped after all the busy-ness of the year and once stopped, refused to be prodded once again to action. I do also confess to some emotional breakdowns and a few pickles. But all seems to once again be moving and alive and straightening out. I can tell by the state of my dining room table. Until this weekend, it was covered with a droopy cloth leftover from company use weeks ago. There were stacks of "to do," "to mail," and "to put away" piles here and there. Someone had cut up paper and left shreds scattered across the length. An odd stapler was lying haphazardly on its side. 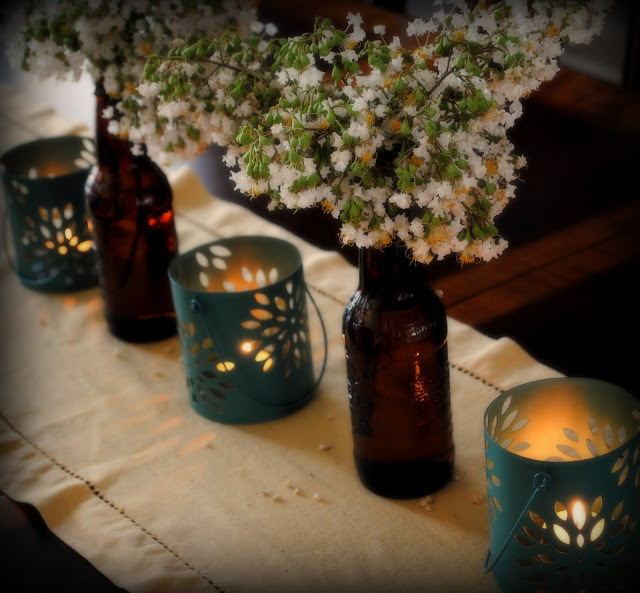 Several vases stood empty, having weeks ago been emptied of their faded contents. This weekend the table was stripped of its mess. Polished. And set to rights. 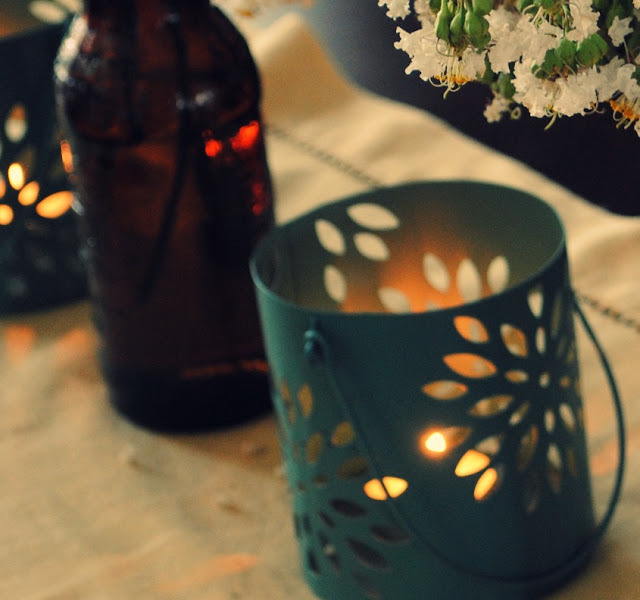 And I love how everything in the middle of my summer table reminds me of some of my favorite summer things. Cool crisp cotton in a buttery yellow. Punched tin lanterns with light glowing through. Filmy, fluttery flowers of the crepe myrtle. Yep, I'm back. The table is cleared and organized. And that table is a pretty clear window into the state of my mind. So, company came and company left. And one thing they left behind was pickles. Pickles sent along from My Husband's Mom. They are legacy . . . journal . . . memory. 90 year-old mother-in-law is not canning pickles anymore. She stopped several years ago when she stopped planting her sprawling garden. And with that stopped the legacy of Mom M's canned pickles. She grew a certain kind of cucumber in her own garden. She grew the dill in her own garden. And she had a magic recipe that included this produce, vinegar, and water. 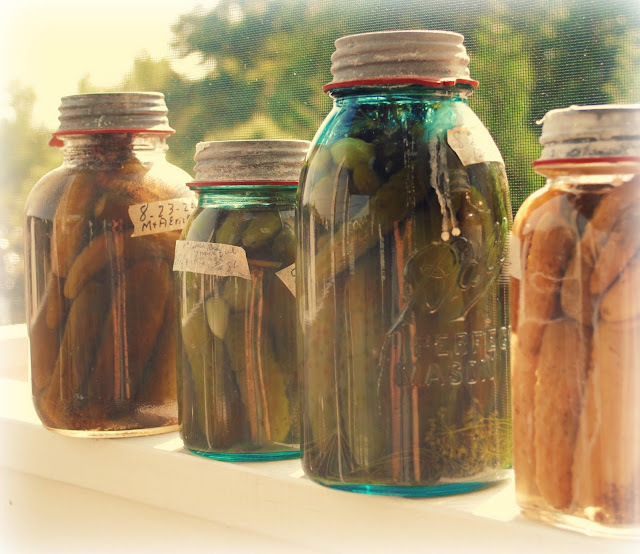 Husband and his siblings have memories of going down the road to pump well water to be brought back for the canning of the pickles. Well water . . . not flavor-marred piped water. Over time, when she lost her well-water-fetching work force, she did condescend to using piped-in water. The source of the water was carefully noted on ripped-off pieces of masking tape, stuck to the jars. Which brings me to the "journal" aspect of Mom's canned pickles. As she canned, she made note of interesting life events, quantities and experiments, and, of course, the water source and its effect on the final quality of the pickles. 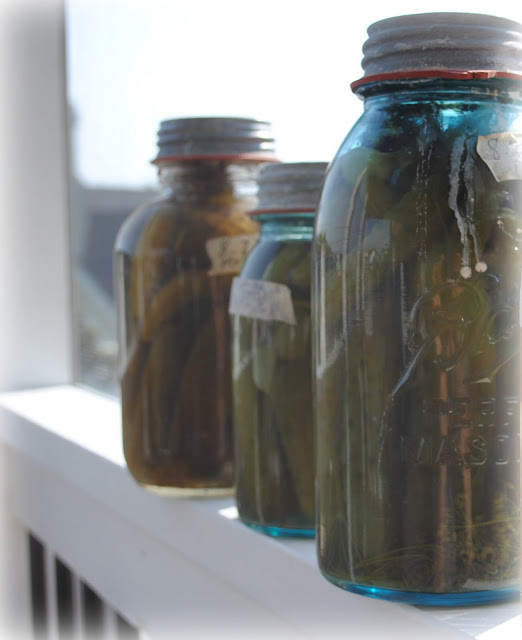 "1 inch rain - thankful"
"Nieces at 2000 World Fair"
"Pastor thinks too much vinegar"
These old Ball jars with their rubber rings, zinc lids, tightly fitted cucumbers and clusters of dill squished in the bottom are a connection to family history. A tongue-tingling sour memory of a Mom's gift to her family. I now have 4 jars of these pickles on the shelf of my pantry. I don't want to open them.